Promotion Boxes - MoskiShield - mosquito repellent patch and spray. 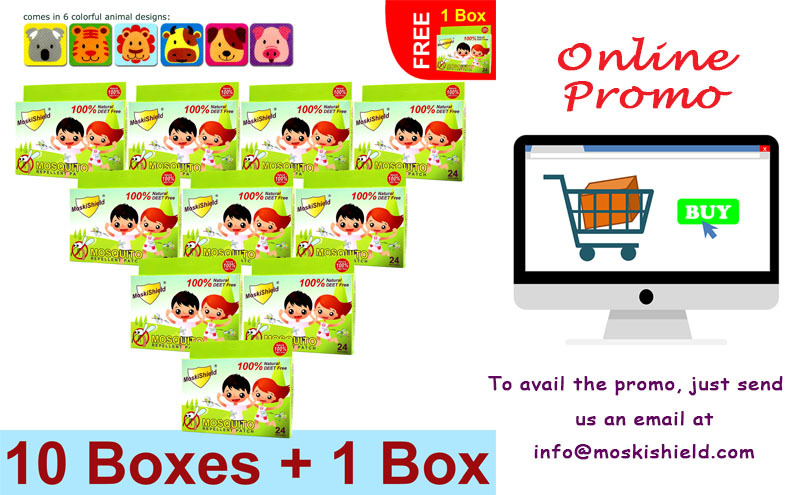 One box (24 patches each box) of MoskiShield mosquito repellent patch is P160 Pesos. Each box contains 4 pouches (each resealable pouch has 6 patches each). *Not valid with any other offers, promotions, or discounts. on orders of 10 MoskiShield boxes or more within the Philippines. Get 24 Patches Free for every 10 Boxes of Moskishield patches. Order from the comfort of your home. You might want to try our MoskiShield spray as well.